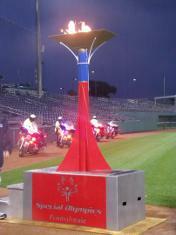 The lighting of the Special Olympic Torch, the Flame of Hope, signified the official start to the 2013 Summer Games. UNIVERSITY PARK — An overcast sky and a little rain didn’t stop the fun, smiles or athletic competition at the 44th annual Special Olympics Pennsylvania Summer Games, held June 6 -8. Sponsored by its premiere state-wide partner Sheetz Inc., the three-day event drew more than 2,000 athletes, 750 coaches and 2,500 volunteers from communities, organizations and corporations across the state. “These games would not take place without our coaches, officials and the volunteers who work year-round in each individual county and on these Special Olympic Summer Games,” said SOPA Opening Ceremony emcee Kellie Goodman Shaffer, executive director at Bedford County Chamber of Commerce. For the 26th year in a row, Penn State University hosted the Summer Games competitions in aquatics, athletics, basketball, bowling, equestrian, golf, gymnastics, softball and tennis at its University Park campus. The athletes’ appreciation toward the Sheetz family and Penn State was apparent with cheers and the boom of thousands of red thunder sticks adorning the Sheetz name. Cheers only increased when Bethlehem County athlete Amanda Reiss took to the microphone at the 2013 Opening Ceremonies, which were held at Medlar Field at Lubrano Park. Reiss said because of cash and in-kind donations made by the Sheetz family, its generosity had reached new levels. Sheetz Inc., Director of Regional Operations Adam Sheetz expressed this commitment and dedication to the athletes, coaches, volunteers and SOPA fans. Volunteer coordinator for Summer Games 2013 Trish Weidemann is also continuously inspired by the determination and attitudes of the athletes. Since her involved with SOPA Summer Games began eight years ago, Weidemann said as much as she gives to the games, she receives so much more in return. “I always walk away from the event saying ‘wow. It’s so great to see the athletes and to help them out.’ I just like to do my part to help out the community,” she said. Like the athletes, she is grateful for the involvement of the Sheetz family and Penn State. From providing bagged lunches and volunteers to the involvement of the Nittany Lion student-athletes, Weidemann said the games might not be possible without Sheetz Inc. and Penn State. For 14-year bowling athlete Michael Silvis, the continued involvement of Sheetz and Penn State, along with his coaches, family and friends has made Special Olympics more extraordinary. “Special Olympics means the world to me. It has helped me grow into the man I am today. Special Olympics is like having a second family. They are always there for you, cheering you and supporting you in your sports and in your life,” he said. Silvis said the fact that his coaches are always pushing him for an extra 110 percent is a good thing. Silvis said this expansion of friends, family and fun is what SOPA is about.